Out in the garden this morning, weeding and watering. 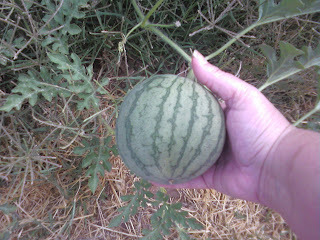 This baby watermelon was only about the size of a nickel a week ago. The heirloom cherry tomatoes are doing nicely. They don't yield as much as a Sweet 100 tomato but the taste is far superior and the color is beautiful, they ripen to a deep burgundy. The regular heirloom tomato plant has grown very large but is still setting blooms even in the 100+ degree desert temps. Lots of large tomatoes on the plant but nothing close to ripening yet. 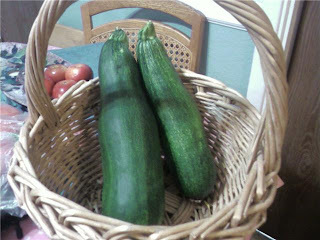 As usual, the zucchini is taking over the yard. It must be doing well in the neighbor's garden as well since they knocked on our door last week offering to share their haul. I told Ben to tell them we'll take one zucchini from their garden if they take two from ours. They're all ready to go . . .